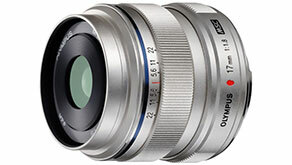 The Olympus M.ZUIKO DIGITAL 17mm 1:1.8 lens possesses outstanding image quality in a lightweight and extremely compact form. Its ultra-bright 1:1.8 large aperture not only facilitates the ability to capture shots with eye-catching depth of field blur, it also enables tripod-free shooting in low light conditions � further accentuated by the in-body image stabilisation of the latest Olympus Micro Four Thirds System cameras. To let users seize the moment and take spontaneous blur-free shots more easily, the new lens features a clever Snapshot Focus mechanism � as in the acclaimed M.ZUIKO DIGITAL ED 12mm 1:2.0 lens that boasts an equally premium build quality. The focusing point is moved to a specific distance by simply sliding the focus ring towards you. Rotating the ring changes the focal distance within the range shown on the lens cylinder, which also features a depth of field scale. Users additionally benefit from fast and extremely quiet autofocusing thanks to the MSC (Movie & Still Compatible) mechanism. Lens flare and ghosting as well as other annoying artefacts have all but been done away too, due to lens surfaces being treated with the special Olympus ZERO (Zuiko Extra-low Reflection Optical) coating. Optionally available are the stylish, high quality metal lens hood (LH-48B ) and lens cap with an engraved Olympus PEN logo (LC-48B - pictured right). Furthermore it is compatible with the optional Olympus VF-1 optical viewfinder, which delivers excellent clarity and visibility for professional framing, rounds out this exceptional new Micro Four Thirds lens highlight.